Page 8, For More Information, Paragraph 2, Sentence 1 For more information about HSIS, contact Carol Tan, Ph.D., FHWA HSIS Program Manager, HRDS, 202-493- 3315, carol.tan@dot.gov. For more information about HSIS, contact Carol Tan, Ph.D., FHWA HSIS Program Manager, HRDS, 202-493- 3315, carol.tan@dot.gov, or Ana Maria Eigen, D.Sc., FHWA HSIS Program Manager, HRDS, 202-493-3315, ana.eigen@dot.gov. The safety effects of horizontal curves and grades on rural two-lane highways have been quantified in the American Association of State Highway and Transportation Officials (AASHTO) Highway Safety Manual (HSM), but it was not previously known whether and how the safety performance of horizontal curves and grades interact. 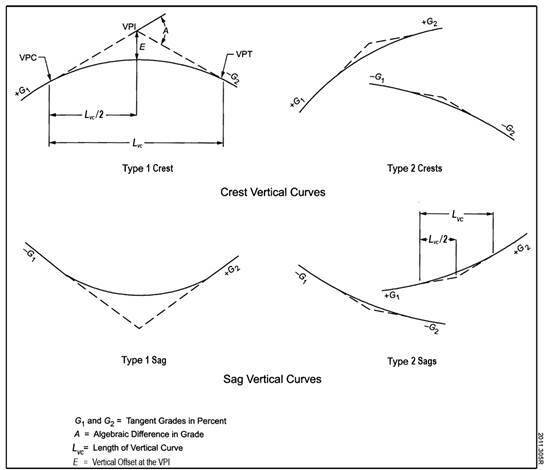 (1) Furthermore, there are no established safety effects for crest and sag vertical curves, and it is unknown whether and how the safety performance of crest or sag vertical curves is affected by the presence of horizontal curves. Design criteria for horizontal and vertical alignment are presented in chapter 3 of the AASHTO Policy on Geometric Design of Highways and Streets, commonly known as the Green Book. (2) Many State highway agencies have their own design manuals, but in terms of horizontal and vertical alignment, they closely resemble the AASHTO Green Book. Straight road sections with no horizontal curvatures are generally referred to as "tangents" because such straight road sections are generally tangent to any horizontal curves that they adjoin. The safety effects of both radius and length of horizontal curves are addressed in CMFs developed in this current study. The safety effects of superelevation and transition design are outside the scope of the study because no data concerning these features were available at the time this study was conducted. Algebraic difference (A) between the initial (G1) and final (G2) grades. K, the ratio of LVC and A, which represents the measure of sharpness of the vertical curve. The safety effects of each of these design parameters for vertical alignment are addressed in CMFs developed in the current study. Source: AASHTO. Used by permission. The research was performed with the Highway Safety Information System (HSIS) data for State highways in Washington. This is the only data source that includes system-wide data on curve and grade geometry that can be linked to system-wide roadway characteristics, traffic volume data, and crash data. Several roadway types were considered, but only rural two-lane highways in Washington had sufficient data for which modeling efforts appeared promising. Of the 6,944 mi of roadway in the entire Washington HSIS database, 4,785 mi (69 percent) are on rural two-lane highways. Of these, 3,457 mi were used for analysis. Rural two-lane highways with passing or climbing lanes and segments with missing or obviously incorrect alignment data (e.g., overlapping curves) were excluded from the study. Roadway length (miles), exposure (million vehicle miles traveled (MVMT) in the 6-year period), crash frequencies, and crash rates per MVMT are shown in table 1 for specific horizontal and vertical alignment for rural two-lane highways. for rural two-lane highways in the Washington HSIS database. aFor years 2003 to 2008. Average annual daily traffic (averaged across all 6 years). Absolute value of percent grade (G). Algebraic difference between the initial (G1) and final (G2) grades (A; A = abs(G1 − G2)). Measure of the sharpness of vertical curvature (K; K = LVC/A). Relevant interactions of selected parameters. For each alignment type combination (as well as each FI and PDO crash), CMFs were calculated as the ratio of the predicted crash frequency for a given horizontal curve and grade combination to the predicted crash frequency for the level tangent base condition. The following subsections provide the equations for CMF in each of the five alignment categories for rural two-lane highways. Figure 2. Equation. FI CMF for horizontal curves and tangents on straight grades. Figure 3. Equation. PDO CMF for horizontal curves and tangents on straight grades. Where SG = straight grade. To calculate CMF for FI or PDO crashes for a given horizontal curve on a level or nonlevel grade or a tangent on a nonlevel grade, the absolute value of G (percent), R (ft), and LC (mi) must be substituted in figure 2 or figure 3. Figure 4. Equation. FI CMF for horizontal curves and tangents at type 1 crest vertical curves. Figure 5. Equation. PDO CMF for horizontal curves and tangents at type 1 crest vertical curves. To calculate CMF for FI or PDO crashes for a given horizontal curve at a type 1 crest vertical curve, the actual values of R (ft), LVC (ft), and parameter K (ft/percent) must be substituted in figure 4 or figure 5. Figure 6. Equation. FI CMF for horizontal curves and tangents at type 1 sag vertical curves. Figure 7. Equation. PDO CMF for horizontal curves and tangents at type 1 sag vertical curves. To calculate CMF for FI or PDO crashes for a given horizontal curve at a type 1 sag vertical curve, the actual values of R (ft), LVC (ft), and parameter K (ft/percent) must be substituted in figure 6 or figure 7. Figure 8. Equation. FI CMF for horizontal curves and tangents at type 2 crest vertical curves. Figure 9. Equation. PDO CMF for horizontal curves and tangents at type 2 crest vertical curves. To calculate CMF for FI or PDO crashes for a given horizontal curve at a type 2 crest vertical curve, the actual value of R (ft) must be substituted in figure 8 or figure 9. Figure 10. Equation. FI CMF for horizontal curves and tangents at type 2 sag vertical curves. Figure 11. Equation. PDO CMF for horizontal curves and tangents at type 2 sag vertical curves. To calculate CMF for FI crashes for a given horizontal curve at a type 2 sag vertical curve, the actual value of R (ft) must be substituted in figure 10 or figure 11, and A must be substituted in figure 11. If R for a horizontal curve is greater than or equal to 11,460 ft, CMF applicable to tangents (on either level or nonlevel grades, as appropriate) should be used rather than CMF for a horizontal curve. For either a tangent or a horizontal curve, if the percent G for a straight grade is between -1.0 and +1.0 percent, the CMF applicable to a level grade (G = 0) should be used. For either a tangent or a horizontal curve, if G1 and G2 are between -1.0 and +1.0 percent, the CMF applicable to a straight grade that is level (G = 0) should be used rather than the CMF for a vertical curve. Figure 12. Equation. CMF for combined crash severity level. CMFTOT = CMF for total crashes (i.e., all severity levels combined). CMFFI = CMF for FI crashes. CMFPDO = CMF for PDO crashes. PFI = FI crashes expressed as a proportion of total crashes. PPDO = PDO crashes expressed as a proportion of total crashes. 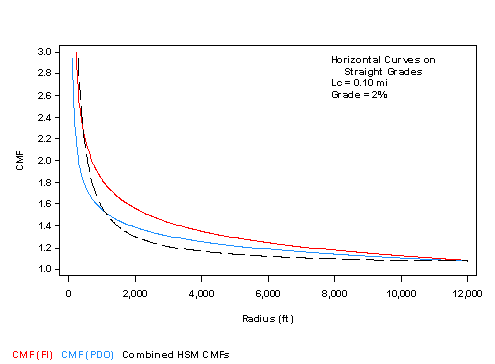 Figure 13 illustrates a typical comparison of CMFs for horizontal curves on straight grades developed in this study, as shown in figure 2 and figure 3 for FI and PDO crashes, respectively, to the combined HSM CMF. The length of horizontal curve and radius were kept constant, while the percent grade was varied. Figure 14 is an analogous plot, where the length of horizontal curve and percent grade were kept constant, while the radius of the horizontal curve varied. The plots show that the CMF for FI crashes developed in the current study is consistently larger than the CMF for PDO crashes developed in the current study. This represents an advance in knowledge compared to the AASHTO HSM, which treated the CMFs as equal for all severity levels. (1) The plots also show that the new CMFs are generally larger than the combined HSM CMFs, except that the new CMF for PDO crashes is smaller than the existing CMFs for horizontal curves with short radii. CMF presented in figure 12 can be considered to replace the combined effect of CMF3r for horizontal curves presented in AASHTO HSM equation 10-13 and CMF5r for grades presented in AASHTO HSM table 10-11. (1) In other words, CMFTOT is a potential substitute for the product of CMF3r × CMF5r in AASHTO HSM equation 10-2, which currently represents the combined total of FI and PDO crashes. (1) It is expected that future AASHTO HSM editions will model FI and PDO crashes separately so that CMFs for individual crash severity levels may be used directly in AASHTO HSM equation 10-2. A decision as to whether new CMFs presented in figure 2 through figure 12 should be incorporated in the AASHTO HSM will be made by AASHTO at some future time. The AASHTO HSM also includes CMF4r, which represents the safety effect of superelevation variance defined for any horizontal curve as the design superelevation rate for that curve recommended in the AASHTO Green Book minus the actual superelevation of the curve. (1,2) The models developed in the current study do not account for superelevation variance, so CMF4r should still be used even if CMF3r and CMF5r are replaced by the new CMFs developed in this current study. Instructions: Description of each tab and its function. Tgt StraightGrade: Calculation of CMFs for tangents on straight grades. 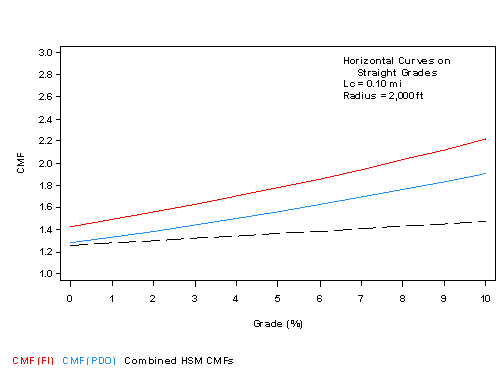 HCurve StraightGrade: Calculation of CMFs for horizontal curves on straight grades. Tgt VCurve: Calculation of CMFs for tangents at vertical curves. HCurve VCurve: Calculation of CMFs for horizontal curves at vertical curves. Worksheets 2–5 provide a table for data input by the user and a table that displays the calculated CMF values. CMF calculations are performed using figure 2 through figure 12. Open the Microsoft Excel® calculation tool workbook at http://www.fhwa.dot.gov/publications/research/safety/hrtm2130/index.cfm. Horizontal curves on straight grades. Horizontal curves at vertical curves. Enter the applicable input data describing the horizontal and vertical alignment in the data input table. The text immediately above the data input table on each worksheet gives guidance on typical ranges of input values. Default values based on AASHTO HSM Chapter 10 are provided for PFI and PPDO, which must sum to 1.0. (1) Users may substitute local values for the PFI and PPDO defaults. Click "Run." The computed CMF values, along with a summary of the input data, will appear on a new row added at the bottom of the results table. Users may choose to display multiple rows in the results table. Click "Reset" to refresh the results table by deleting all displayed rows. Figure 15. Screenshot. 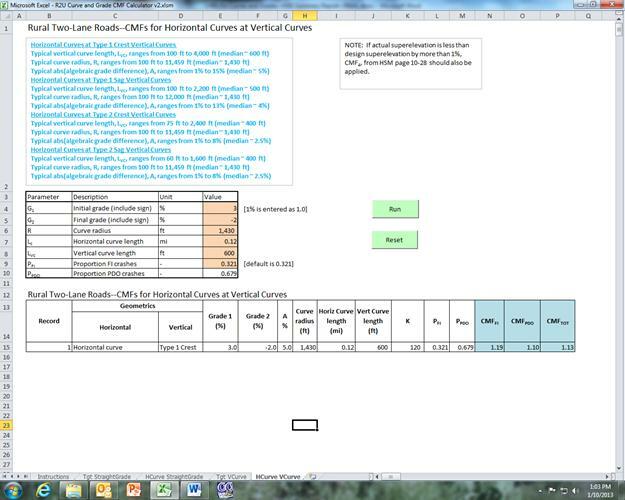 Sample screen for horizontal curve at type 1 crest CMF calculations. American Association of State Highway and Transportation Officials. (2010). Highway Safety Manual, 1st Edition, AASHTO, Washington, DC. American Association of State Highway and Transportation Officials. (2011). A Policy on Geometric Design of Highways and Streets, AASHTO, Washington, DC. Bauer, K.M. and Harwood, D.W. (2013). Safety Effects of Horizontal Curve and Grade Combinations on Rural Two-Lane Highways, Report No. FHWA-HRT-13-077, Federal Highway Administration, Washington, DC. SAS® Institute Inc. (2011). SAS® 9.3 User's Guide, SAS Institute Inc., Cary, NC. Federal Highway Administration. Highway Safety Information System, U.S. Department of Transportation, Washington, DC. Obtained from: www.hsisinfo.org. For more information about HSIS, contact Carol Tan, Ph.D., FHWA HSIS Program Manager, HRDS, 202-493-3315, carol.tan@dot.gov or Ana Maria Eigen, D.Sc., FHWA HSIS Program Manager, HRDS, 202-493-3315, ana.eigen@dot.gov.